Paul Bettany, who plays the Vision in Marvel Studios' shared cinematic universe, spoke briefly on Avengers: Infinity War tackling the romance that the superhero android shares with Scarlet Witch (Elizabeth Olsen) in the Marvel comics. Set photos from April confirmed the developing Wanda / Vision connection, leading to Olsen speaking on the romance in July: "In any other world I would say, 'I don’t know,' but because there are paparazzi photos that kind of spoil things for fans – I think it’s safe to say that we now get to explore that part of the comic book," Olsen explained. "We get to introduce and really explore their relationship. It creates a really exciting arc for me and I’m so lucky I get to work with (Paul) Bettany all the time now." When asked by Yahoo about the evolution of the relationship between Wanda and Vision, Olsen's Infinity War co-star, Jeremy Renner, was quick to joke the two Avengers are "in a cabin upstate," with Olsen adding, "making robot love." In the comics, Vision was a synthezoid automaton created by Ultron, one of the Avengers' most vicious foes. Wanda, similarly, was a mutant and the daughter of Magneto, villain and archfoe of the X-Men. Both Vision and Wanda started things off on the wrong foot, both eventually becoming heroes, Avengers — and lovers. Though their romance was an unorthodox one, to say the least, the coupling is an iconic one, and one that would eventually lead to the disassembling of the Avengers in a 2004 crossover event. On the movie side of things, the Marvel Cinematic Universe also had Vision birthed through a combination of Ultron (James Spader), Tony Stark's (Robert Downey Jr.) J.A.R.V.I.S., Thor's (Chris Hemsworth) lightning, and an Infinity stone (the Mind Stone). Similarly, Wanda Maximoff underwent experiments conducted by HYDRA, becoming enhanced by way of Loki's (Tom Hiddleston) scepter, which housed the Mind Stone. Because they both received powers from the Mind Stone, the two already share a connection, and the seeds for a romance were planted in Captain America: Civil War — even if the pair found themselves on opposite sides of the schism that split the Avengers. 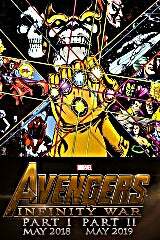 Olsen and Bettany co-star in Avengers: Infinity War alongside Robert Downey, Jr., Chris Evans, Chris Hemsworth, Mark Ruffalo, Scarlett Johansson, Tom Holland, Sebastian Stan, Benedict Cumberbatch, Benedict Wong, Chris Pratt, Zoe Saldana, Karen Gillan, Vin Diesel, Dave Bautista, Bradley Cooper, Pom Klementieff, and Josh Brolin.